Oculus VR’s Palmer Luckey, left, and Nate Mitchell, right. At center, AllThingsD’s Lauren Goode tries out the Oculus Rift at CES 2013. This is the second part of our two-part Q&A with Palmer Luckey and Nate Mitchell, the co-founders of virtual-reality gaming company Oculus VR. In Part One, Luckey and Mitchell discussed controlling expectations, what they want from developers, and the challenges of trying to make games do something radically different. No, seriously, they’re doing something sort of similar with getting this wearable computing device to developers. Does the early buzz about Glass worry you? Luckey: No. They’re not a gaming device, and they’re not a VR device, and they’re not an immersive device, and they’re five times more expensive than us. Luckey: Our image size is like 15 times larger than theirs. It’s like the difference between looking at a watch screen and a 60-inch monitor. It’s just an enormous difference. Mitchell: With the Rift, you’re in there. You’re totally immersed in the world. I think one of the things people keep bringing up (with Glass) is the awkward, the social aspect. For the Rift, you strap into this thing, and you’re gone. Luckey: It’s about being inside the virtual world, not caring about the real one. 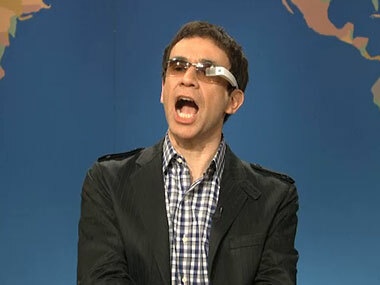 Mitchell: You could put your Glass on in the virtual space. Luckey: We could do that! We could simulate Glass. … It’s not that hard. You just have a tiny heads-up display floating there. A really tiny one. Luckey: There’s actually Second Life mods like that. People sell heads-up displays that you can buy. Luckey: And they put information in there like distance to waypoints and stuff. Luckey: Yeah, they overlay it on the screen when your character’s wearing it. Luckey: It’s very difficult to get into. There’s a steep learning curve. The last time I went into Second Life was to buy bitcoins from a crazy guy who was selling them below market value, but you had to go into Second Life to meet with him. Mitchell: The underbelly of the Internet. Luckey: They’re actually working on Oculus Rift support, though. The kind of people who make games like Second Life definitely see the potential for virtual reality — being able to step into your virtual life. And if you’re completely immersed in the game, I guess that wherever you’re playing, you need to trust whoever’s around you. Mitchell: Absolutely. There’s already some sneaking up on people happening in the office. Someone’s developing, they’re testing the latest integration, and then Palmer comes up and puts his hands on their shoulders: “Heyyyy, Andrew! What’s going on?” There’s a trust factor. Mitchell: One thing that that does lead into is, we’re exploring ways to just improve the usability of the device. When you put on the Rift, especially with the dev kit, you’re shut off from the outside world. What we’re looking at doing is how can we make it easy to pull it off. Right now, you have to slip it over your head like ski goggles. The dev kit was designed to be this functional tool, not the perfect play-for-10-hours device. With the consumer version, we’re going for that polished user experience. What about motion sickness? Is it possible to overcome the current need for people to only play for a short period of time on their first go? Luckey: The better we make the hardware, the easier it’ll be for people to just pick up and play. Right now, the hardware isn’t perfect. That’s one of the innate problems of VR: You’re trying to make something that tricks your brain into thinking it’s real. Your brain is very sensitive at telling you things are wrong. The better you can make it, the more realistic you can make it, the more easily your brain’s gonna accept the illusion and not be throwing warning bells. Luckey: — he’s running at like 40 miles per hour. But it’s not just, “Oh, I’m running fast.” It’s the physics of the whole thing. In real life, if you are driving at 40mph, you can’t instantly start moving backward. You can’t instantly start strafing sideways. You have inertia. And that’s something that, right now, games are not designed to have. You’re reacting in these impossible ways. Mitchell: In that same vein, just as Palmer’s saying the hardware’s not perfect yet, a huge part of it is the content. Luckey: You could make perfect hardware. Pretend we have the Matrix. Now you take someone and put them in a fighter jet and have them spinning in circles. That’s going to make someone sick no matter how good it is, because that actually does make people sick. If you make perfect hardware, and then you do things that make people sick in real life, you’re gonna make them sick in VR, too. Right now, there’s lots of things going on in games that don’t make people sick only because they’re looking at them on a screen. Or, in so many games, they’ll have cutscenes where they take control of the camera and shake it around. You don’t want to do that in VR because you’re not actually shaking around in real life. You’re changing the experience that you have previously established within VR. Mitchell: It breaks the immersion. Luckey: And that’s why it’s so hard to instantly transfer. In the original version of Half Life 2, when you’d go into a new space for the first time, the whole game would just freeze for a second while it loads. It’s just a short freeze, but players were running along or driving along and all of a sudden, jjt! Now it looks like the whole world’s dragging along with you, and a lot of people feel very queasy when that happens. Mitchell: It comes back to content. My talk at GDC was very specifically about how developing for VR is different from a 2-D monitor. All those things like cutscenes, storytelling, scale of the world — if the player is at four feet on the 2-D monitor and you put them in there, they immediately notice. They look down and they have the stereo cues: “I’m a midget!” So you make them taller, and now they don’t fit through doors. We really do believe that, at first, you’re going to see these ports of existing games, but the best “killer app” experiences are going to come from those made-for-VR games. Luckey: And that’s not even to say it has to be new franchises. It doesn’t have to be a new type of game. But you want the content to be designed specifically for the hardware. Mitchell: It’s just like the iPhone. The best games come from developers pairing hardware and software. 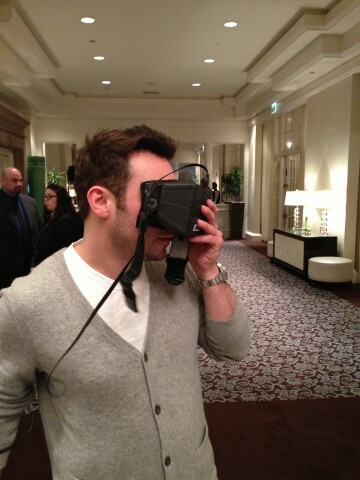 Oculus VR CEO Brendan Iribe testing out the Rift at D: Dive Into Media. And that’s the 10,000-foot view: Does VR change game design in a fundamental way? Mitchell: Yes. Fundamentally. Absolutely. I think, right now, there’s this great renaissance in the indie community. Indie developers are doing awesome things. If you look at games like The Walking Dead, you’ve got the mainstream genres here. You’re going to have a lot of these indie games start to feel more natural in virtual reality, because that’s almost, like, the intended experience. Luckey: And not to invent a whole new genre on the fly, but you don’t see many first-person card games or something. There’s a lot of card game videogames, but there’s not many that are first-person because it wouldn’t make any sense to do. Like a poker game where you could look around the table and read people’s reactions? Luckey: And you could have all kinds of things integrated into it. I guess that would fit into the first-person-shooter genre, but not really, because you’re not moving and you’re not shooting. You’re just playing cards. Mitchell: And if you look at the research that’s been done on virtual characters, it’s the type of thing where, if you smile at me in VR, even if you’re an NPC (non-playable character), I’m much more likely to smile back. Your brain is tricked into believing you’re there. Luckey: There’s also fascinating research on confidence levels in VR, even tiny things. There was a study where a bunch of people performed tasks in real life, in a control group, and then performed them in VR. And the only difference is that one group in VR was about six inches taller than the other group. So, one was shorter than the NPC they were interacting with, one was taller. Universally, all of the “taller” people exhibited better negotiation with the NPCs. Then, they took them out (of the VR simulation) and they redid the (real-world) study, putting everyone back in another trial with a physical person. The people who’d been tall in VR and negotiated as a taller person did better when they went back into the real negotiation as well. It’s ridiculous. Mitchell: That’s the sort of thing we’re super-excited about. That’s the dream. Mitchell: When the dream comes to fruition? Not when it comes to fruition. Are there milestones for specific accomplishments along the way? Mitchell: We have a road map, but like we keep saying, a huge part of this is content. Without the content, it’s just a pair of ski goggles. Luckey: And we don’t even know, necessarily, what a road map needs to look like. We’re getting this feedback, and if a lot of people need a certain feature — well, that means it’s going to take a little longer. Mitchell: But we have a rough road map planned, and a lot of exciting stuff planned that I think you’ll see over the course of the next year. And is there a timeline for when the first consumer version comes out? Mitchell: It’s TBD. But what we can say is, Microsoft and Sony release their dev kits years in advance before they get up onstage and say, “The Xbox One is coming.” We went for the same strategy, just open and publicly. Luckey: And we don’t want to wait many years before doing it. Mitchell: Right. So, right now, we’re giving developers the chance to build content, but they’re also co-developing the consumer version of the Rift with us. Once everyone’s really happy with it, that’s when you’ll see us come to market. Luckey: And not sooner. We don’t want to announce something and then push for that date, even though we know we can make it better. And what about the company, Oculus VR? Is this dream you’re talking about something you have to realize on your own? Do you want to someday get acquired? Luckey: Our No. 1 goal is doing it on our own. We’re not looking to get acquired, we’re not looking to flip the company or anything. I mean, partnering with someone? Sure, we’re totally open to discussions. We’re not, like, we want to do this with no help. But you wouldn’t want to be absorbed into a bigger company that’s doing more than just VR. Not to be too hyperbolic or anything. Luckey: It’s hard not to be. It’s like every other technological advance could practically be moot if you could do all of it in the virtual world. Why would you even need to advance those things in the real world? Mitchell: With that in mind, we have to figure out how we get there. But right now, we’re doing it on our own. Luckey: And we think we can deliver a good consumer VR experience without having to partner with anyone. We’re open to partnering, but we don’t think we have to. We’re not banking on it. And how does being based in southern California compare to being closer to a more conventional tech hub like Silicon Valley? Mitchell: Recruiting is a little harder for us. But overall, we’ve been able to attract incredible talent. Mitchell: — that’s where I’d want to be. Luckey: But in this case, these people aren’t necessarily all up in Silicon Valley. We’ve hired a bunch of people from Texas and Virginia and all these other places. It’s a niche industry. We actually have the biggest concentration of people working in consumer VR right now. And a lot of the top talent we get, they don’t care where we are, as long as it’s not, like, Alaska. They just really want to work on virtual reality, and there’s no one else doing it like we are.